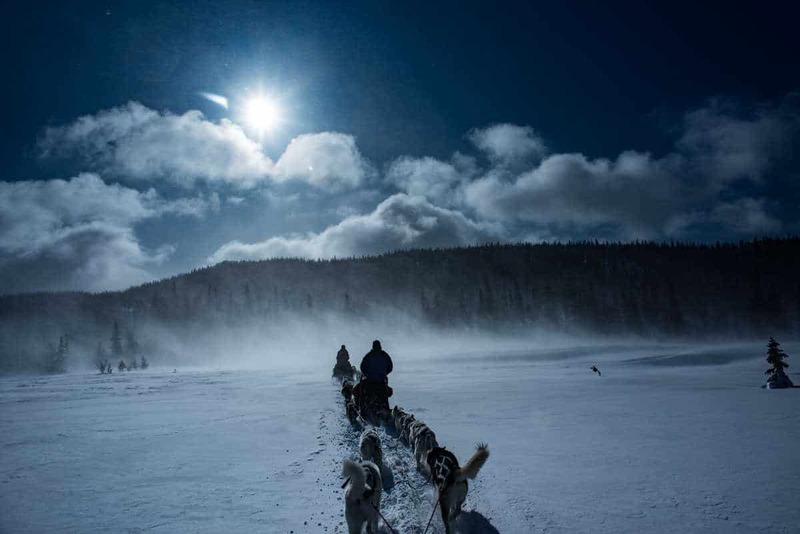 The wind dusting up fresh fallen snow adds to the thrill of dogsledding in the wilderness near Åre, Sweden, under a cold sun. Åre (pronounced or-rey), Sweden, isn’t just a ski town, though it would be the first place I’d recommend if you want a top notch ski destination in Scandinavia, or anywhere. This town (pop. 1,700), in Jämtland County in Sweden’s middle west, stands on its own any time of year with its own community and vibrance, apart from any ski crowd. In fact, Åre, Sweden, was established as a summer destination, a retreat for good health and exercise in the exceptional clean mountain air. Further back in time, Åre was near the assembly point and desperate end of the infamous Carolean Death March, a failed military exercise in 1718 when King Karl XII had visions of commanding all of Norway. Even before that, following the death of Viking King Olav in 1030 and his subsequent sainthood, Åre and nearby Östersund welcomed pilgrims traveling across the northlands to his burial site in the Nidaros Cathedral in Trondheim, Norway. A 12th Century icon of St. Olav in Åre’s Old Church. So they say, with just a bit of tongue in cheek, that Jämtland Härjedalen is the birthplace of tourism. (The two counties work jointly on tourism under the tag, “Adventure Sweden.”) It’s safe to say that present-day Åre has mastered the art of hospitality. Our initial visit–we will be returning to enjoy more seasons in this oasis–was in March 2018. We did all we could possibly do in a week, learned from everyone we met, and ate heartily day in and out. So, with our genuine fondness for the place, we have these recommendations to share, with more posts on food and specifics to follow. In Östersund, the capital city of Jämtland, and in Åre, the sense of community among people we met was palpable and genuine. With small-town camaraderie, our local friends were constantly greeting others on the street, catching up on family and business news, and offering to help each other out. Even competitive businesses praised each other and were quick to point out ways in which they cooperate. One restaurant, for example, provides their homemade sausage to another restaurant. We started in Östersund, arriving on a quick flight from Stockholm. (See below for other ways to get here.) Östersund airport is actually on Fösön Island in Storsjön (“Great Lake”), so our drive started along the shores of the lake. We were immediately reminded of northern Minnesota by the lakes, pine forests, and rolling hills. 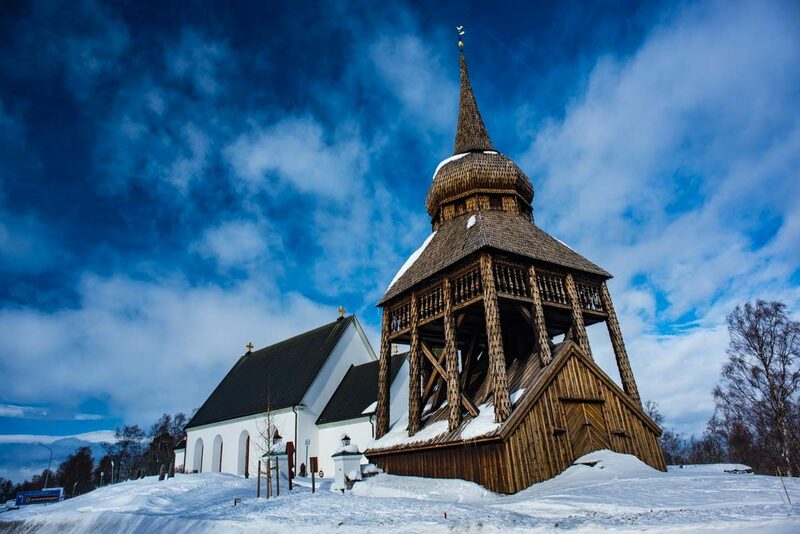 The old church at Fösön sports a distinctive wooden bell tower and is a favorite spot for local weddings. The wind was whipping snow up into the bright sun when we made a quick stop at the historic church in Fösön village. There we were introduced us to the iconic bell tower shape popular in Sweden, and to the St. Olav Pilgrimage we’d hear more about later. The Viking era tapestry was discovered in 1910 by artist Paul Jonze taking inventory of local culture. Photo courtesy of Jamtli Museum. The museum’s prize artifact is a Viking era (800-1050) tapestry. 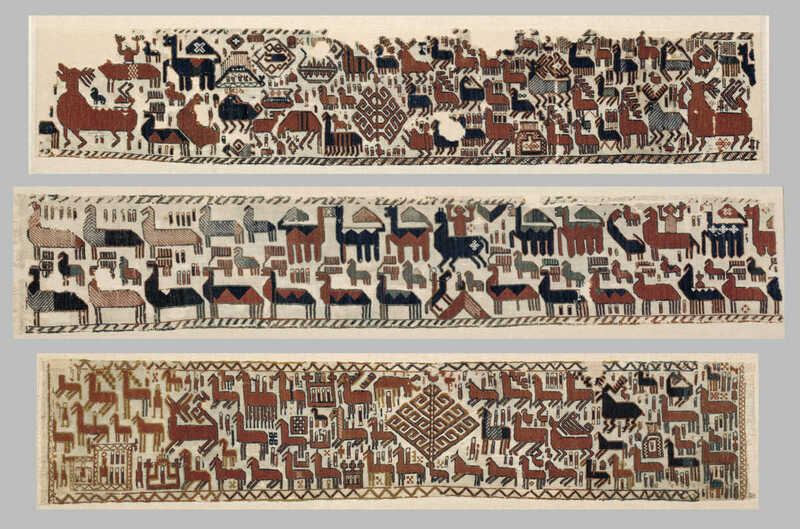 The Överhogdal tapestry’s story, much debated, is depicted via wool figures embroidered on a linen backing. Jämtli Museum was the first of dozens of places we visited in Sweden (the Gotland Museum in Visby another notable example) that made us wish we had our extended family with us. The children’s exhibits are not segregated from the whole, but integrated throughout, making the experience better for adults, too. Even 1000 years ago, as Viking era traffic patterns were becoming established between the Baltic and North Atlantic Oceans, people settled in this valley alongside Lake Åresjön where resources were abundant. As Christianity took hold and the pilgrims flowed through, Åre’s Old Church, dating to the 12th Century, was built. It remains open today. The town and Åreskulan, the Åre mountain, mark the start of the Scandinavian Mountain Range that divides Norway and Sweden. Sami people began to settle in the area in the 17th Century, attracted by rich reindeer pasturelands. Mining of local copper blossomed in the 18th and into the 19th Centuries. But for tourism, specifically, things started to take off when the railroad reached the Åre valley in 1882, connecting Östersund to the East and Trondheim and the North Atlantic to the West. At this time of Swedish nationalism and romanticism, the natural environment and crisp mountain air inspired summer travelers from a broader area, even continental Europe. For good air and health, hikes, fishing, and mountain sports, visitors were drawn to Åre. The landmark tram starts right here in in the middle of Åre. Ski to the town square or tram up to the Restaurant Fjällgården. A woman from Östersund, Kristina Olsson, took notice and opened the first hotel in 1895 (now Åregården Hotel), beating out another hospitality-minded contender who soon followed with his Grand Hotel. By 1910, a fellow who had admired the funicular in Davos, Switzerland, installed the first tram on Åre Mountain. It’s still running today, though only part way up the mountainside, as his lofty dream was underfunded. The mountain was developed as a serious ski destination beginning in the 1970s, and is now one of the world’s top ski areas. In 2019, Åre will host the FIS Alpine World Ski Championships, and the Audi FIS Ski World Cup Finals were just wrapping up the day we arrived. (When you see Audi sponsorships here, you can thank Audi’s interest in test driving cars on the vast frozen lakes in the area.) All the Winter Olympians I’d just watched on TV were hanging out and competing right here in Åre. Since the 1990s, Åre has climbed into top position among mountain bikers, too, hosting World Championship events and plenty of other activity on its trails and bike park. So even before Åre was a top ski destination, it was a town with its own vibe, its particular mix of energetic residents, its love of nature, and its position on an important Scandinavian trail–in all seasons. Åre serves winter and summer guests and residents with equal aplomb. Access to sporting goods stores or restaurants is balanced with local services like a grocery store and library. It’s a walkable town, centered around a lively square where kids play on snow mounds and you can grab a good cup of coffee. All that makes Åre a richer destination for visitors, who will quickly appreciate the people who love living here, the plentiful family-friendly activities, and the serious mood-booster of clean air, bright snow, and–if you’re lucky–sunny skies and northern lights. You must know, dear readers, that we’re not youthful and we are selectively adventurous. 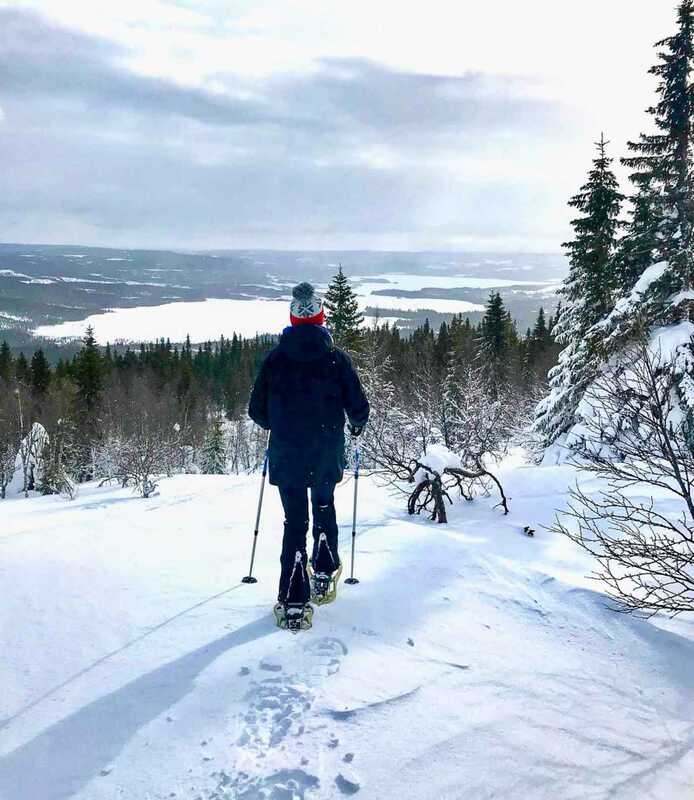 So it was with some awe and amazement–and an injection of Jämtland enthusiasm–that we enjoyed ourselves so thoroughly participating in Åre’s winter activities. Get out there and enjoy! That’s the thrill of winter. Åre is capable of assisting all ages and all levels on the slopes, on the lake, in the woods, winter and summer. 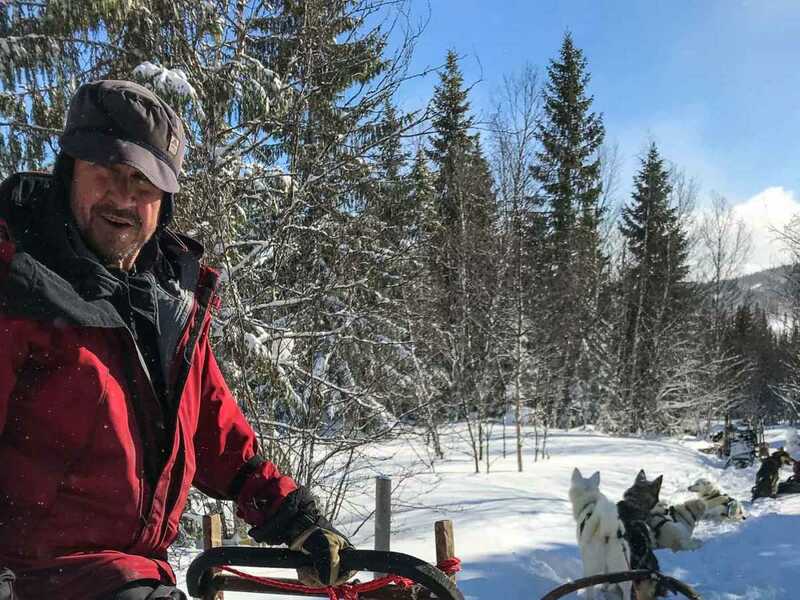 Introduced to dogsledding by Kaj, a man who loves his job. Yup, this was a first for us, and it was so cool! Our intrepid leader Kaj was as thrilled as a kid, too, to find that we were breaking trails as in the olden days, through a fresh and drifting snowfall over a base close to two meters (six feet) in depth. Kaj instructed us to keep the lead taut and showed us how to brake…and off we went. During a rest in the run, nestled next to a fire in a hut in the woods (where the cabin owner, a woman about my age, stopped by to rake snow off the roof), we learned Kaj had originally visited Åre for the skiing and never left. His teams of dogs are beautiful, happy, and well behaved. When we asked Kaj for his secret training and handling the dogs, he described the process from the beginning, walking one dog with simple commands, over and over. “Go.” “Stop.” “Left.” “Right.” Only in Swedish, of course. The trick, he said, is to be more patient than the dog. The sleds move fast, and we could appreciate that the lead dog needs to respond without hesitation, or you’d quickly miss your turn. Snowshoeing taken to the next level with frequent stops for views and samples of local flavors. No reason to be intimidated by this sport. It’s as easy as walking, and offers non-skiers a chance to get out and enjoy winter scenery. Snowshoes are compact and light these days, but big enough to keep trekkers on top of the snow (mostly) and make some cool Big Foot tracks. Our outing with ExploreAre, started from Copperhill Mountain Lodge and included frequent stops to snack as we chatted about the animal tracks, trees, seasons, and long views off the back of Björn Mountain. Oh, that we’d had more time to check out more trails. But we were thrilled to have a little one-on-one time with Åre guide Jesper Johnson at the X-country and Nordic ski arena in Åre at Bjorn Mountain. This area is just part of hundreds of miles of trails in the area, many groomed and signed by their local villages. At this ski center, courses range from 1K to 15K, accommodating traditional and skate skiers. It’s the training ground for many Olympians, and Jesper mentioned the athlete who skies home across the mountains after her training here. In our case, we simply enjoyed Jesper’s great attitude and patience as we got our feet under us. Next time we’ll go farther faster! At the peak, up beyond the last lift. Worth it! Check out the fancy crystals of snow, unique to this area. Ski Åre Sweden. Tom’s not a skier, and I hadn’t planned on going downhill, given the age of my knees (much older than I). But once we moved into our luxury quarters at Copperhill Mountain Lodge, I couldn’t resist. The combined ski area, managed by SkiStar, covers three mountains, running from above the tree line to the valley. Many locals enjoy climbing under their own power, at least to the final peak beyond the lifts. Snowboards and skiers coexist nicely. There’s plenty of space for serious competitors, intrepid teens, intent beginners and careful seniors. I’d love to do that again. 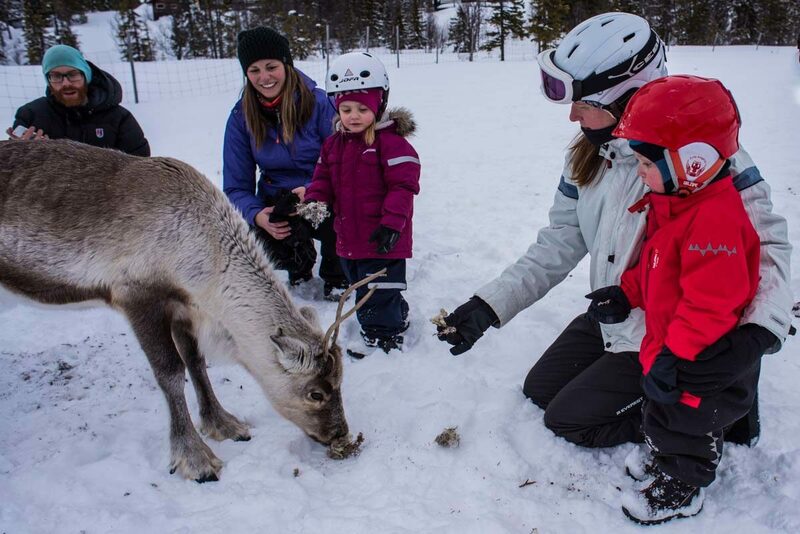 We rode out to a Sami village outside Åre with a group of children just to feed the reindeer. A great way to see reindeer up close, rather than bumping into them on the road, is to arrange a visit with a local Sami community. 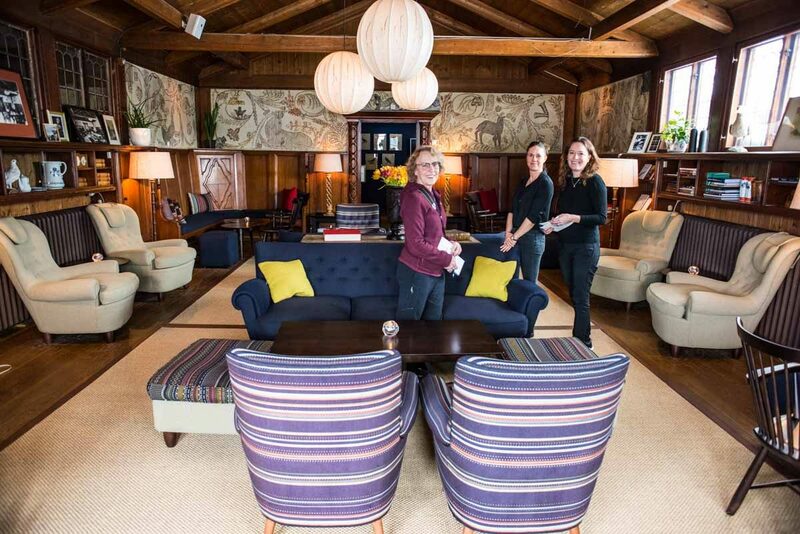 Registration is in the funky local ski lodge of Trillevallen, a throwback to simpler ski days. Snowmobile-drawn sleighs transport families to the corral in winter when it’s possible to feed the reindeer and chat with Sami residents about their work. Samis have exclusive rights to reindeer husbandry, and reindeer have free roam of the countryside. They are herded annually, breed annually, and, after taking your dried moss offering, might be dinner on your plate. If you haven’t had enough fun yet, check out outfitters and guides for ice fishing or snowmobiling. Both activities seem to be especially popular for groups and company outings. This or St. Olav’s Pilgrimage will likely be the focus of our next visit to Sweden. Allemansrätten, the right to walk about even across private land, as long as the land is left undisturbed, is a basic principle of life in Sweden. Though there are as many trekking options as there are hikers in this region, this triangular course touches on three lodges managed by the Swedish Tourist Association (STF), a phenomenon in its own right. The Association was started in 1885 by a group of geology students at the university in Uppsala to provide accessibility and protection for hikers. 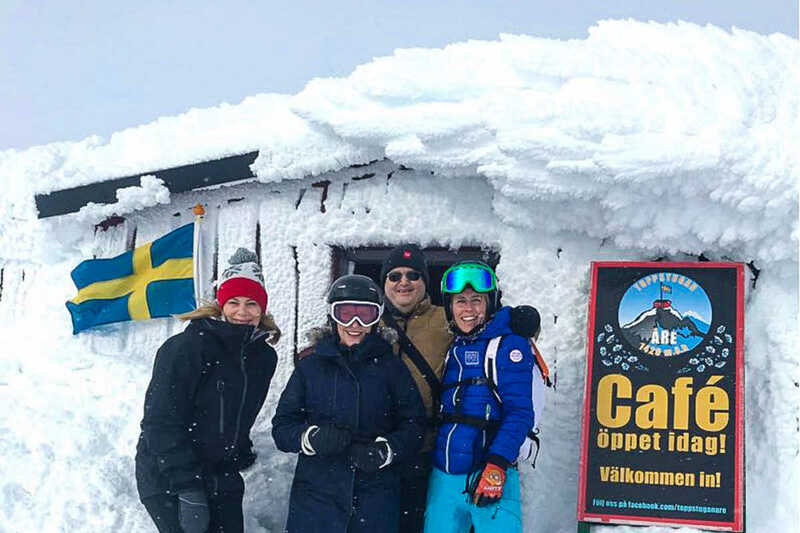 Today, the membership group of more than 230,000 maintains posted trails and more than 350 accommodations across Sweden, including lodges, cabins, and hostels. Check out their site to plan your trek, or visit the hostel in Åre. The village that popped up around the copper mining district remained inhabited into the 1970s, even though mining wrapped up earlier in the 20th Century. Today, the site boasts a number of trail heads, a restaurant, some nice exhibits on the mining history, and well-managed grounds for a picnic. Grab your coffee and cinnamon bun and head out for a fresh air Fika! 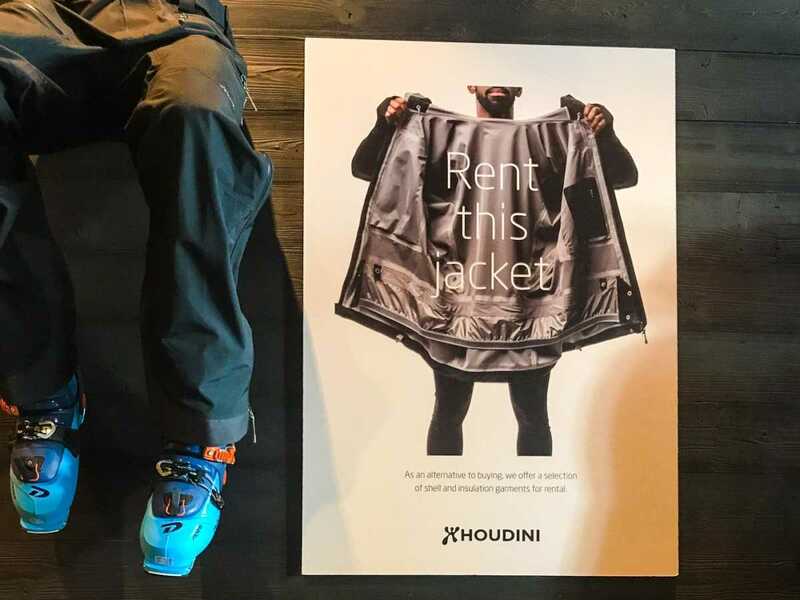 Local sportswear manufacturer Houdini has pioneered apparel rental from their shop in town or from Copperhill Mountain ski shop. Some of sports’ top brands were started here in Åre, like Peak Performance and Houdini, the latter pioneering a great concept in renting out skiwear. 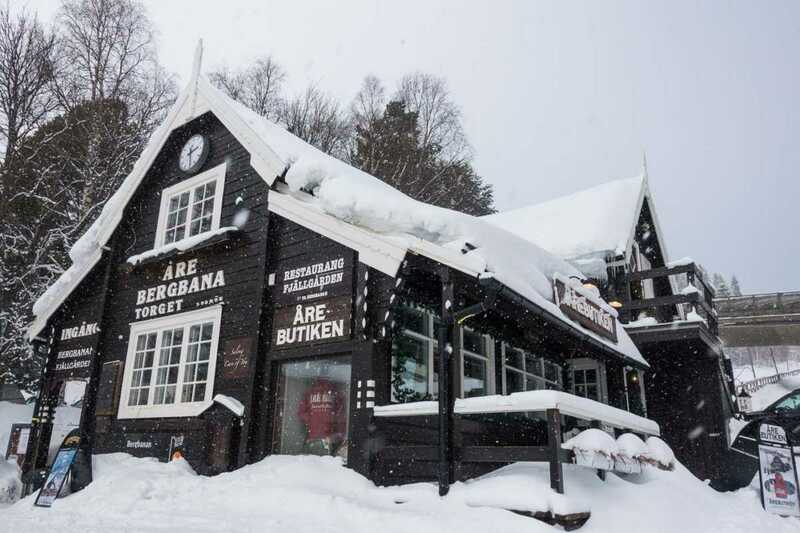 Local crafts and photography works are available at Åre Hemslöjd (Åre Handicraft) and various shops showcase local textiles, jewelry, pottery and glass. It’s a beautiful place to work on your nature photography, with amazing light at 63 degrees 24 minutes North. At the right time of year, you are likely to take in magnificent displays of Northern Lights. You might want to arrange a northern lights tour or a photography workshop with master photographer of these Aurora Borealis, Göran Strand. Summer brings on competitions in downhill biking, and plenty of action for mountain bikers and cross country bikers. Number one on the world’s Swedish gastronomy radar is Jämtland’s Faviken Restaurant and its famous chef, Magnus Nilsson. Thanks in part to the gorgeous episode of Chef’s Table featuring not only the man and the restaurant, but the light and landscape of the region, Faviken enjoys fully booked tables months in advance at highly exclusive prices. If you’re thinking of visiting, book your table before your flight. Uvisan’s Negoni cocktail made with juice of Rowan berries instead of Campari. They say an abundance of these berries means a lot of snow. There must have been a lot of berries last fall! Fortunately, we were able to book a table in Magnus Nilsson’s associated ‘pop-up’ restaurant, Uvisan. The venue right in town is another indicator of the magnanimous work of many Åre residents, in this case Nilsson making sure his key chefs have a creative outlet of their own. Impressive. The pop-up changes according to the time of day, a bakery in the morning, a cocktail bar after work, and the Japanese inspired Uvisan menu we enjoyed at night. 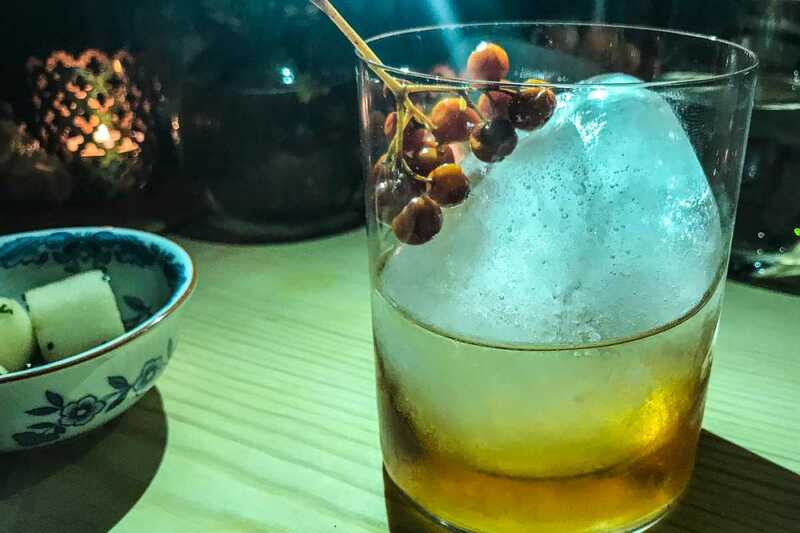 The tasting menu with accompanying wines and sake was a complete sensory treat, featuring everything from smoked eel presented on a stone dish nestled in moss to a sukiyaki course with savory mushrooms and delicate slivers of moose meat cooked at table. Two of our favorite meals were served in our hotels. (Americans: put aside your preconceived notions that hotel restaurants are overpriced and underwhelming.) In the historic Hotel Åregården our first night, we cozied into the Vinbaren wine bar where a couple local soccer stars were spreading their good cheer. We raved over a pork belly perfectly prepared with crispy fat and moist strata of meat, served with a tangy cabbage and apple side. Had we had another day with appetite, we’d have returned to Aregarden’s Wine Bar or their hotel Restaurant Capo. Chef Sonny Gustafsson, who also operates the burger joint Broken in town, had been involved in the hotel’s restaurants for years before the entire hotel went on the market. Rather than risk losing what he’d built, Sonny and friends bought the entire property and lovingly share it with Åre and its visitors. Tender reindeer, the main course of our tasting menu at Copperhill Ski Resort. Another extraordinary menu was served to us at Copperhill Mountain Lodge, in their warm Library restaurant space. We were so enamored by the menu and service I’m afraid we embarrassed the staff with our praise. 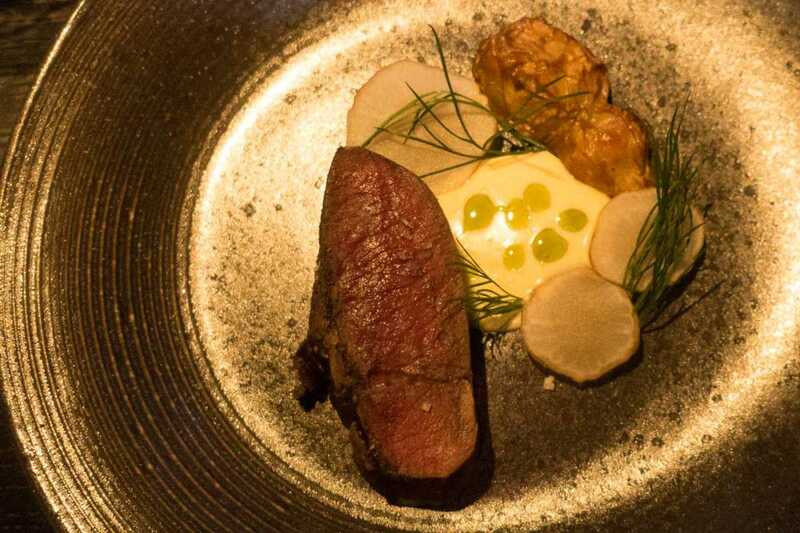 Our tasting menu standouts included a gherkin pickle with vodka and caviar, a starter omelet smooth as custard and laced with truffles, and our main dish of reindeer cooked medium rare and served with artichoke. For a culinary introduction to the area, take a gastronomy tour. It’s a great way to learn about the particular produce and manufacturing in the area. Our gastro tour was presented by our guide Alexandra of ExploreAre while we snowshoed, so the samples also signified rewards for our efforts and complemented the fresh air. Herbal tea, a tart fruit juice, moose sausage, reindeer jerky, and locally produced chocolates–some with the ubiquitous and delicious cloudberry–enticed us to appreciate our environment all the more. 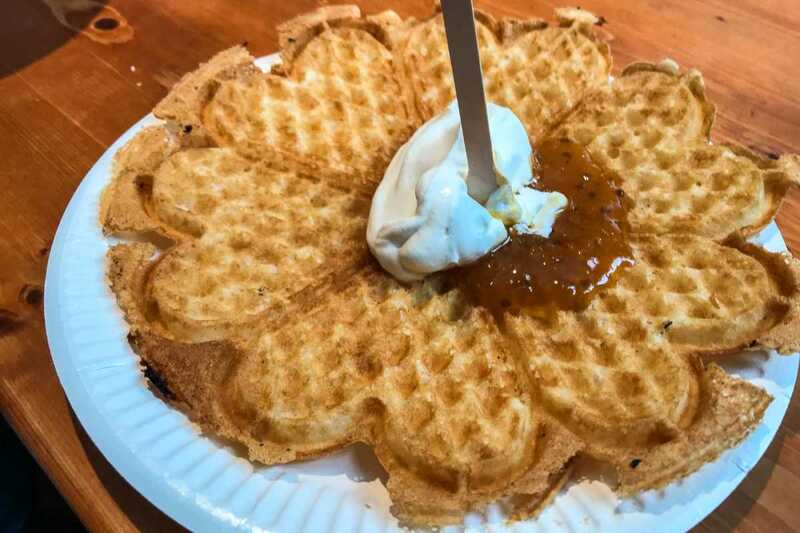 Ski Åreskutan and you may be rewarded with a waffle topped with cloudberry jam and whipped cream. Our five days in Åre included plenty of other wonderful food meet-ups. The town supports some 50 eateries in peak season, and roughly half that year round. The variety will satisfy all: We enjoyed a dinner at Bombom overlooking the town square, a lunch at Creperie & Logi, and a quick fix at the ubiquitous and tasty fast-food chain, Max, Sweden’s tasty answer to McDonalds. Ski to their doorstep on the square. 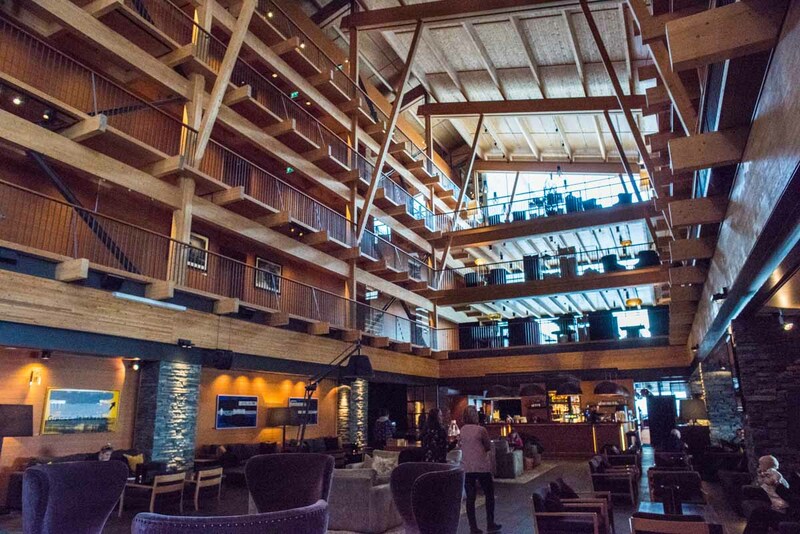 We split our time in Åre between two hotels, and I honestly would hope to do that again on a repeat visit, as both offer strengths and both are uniquely positioned to enjoy all that Åre has to offer. With hotel staff Frida and Elizabeth in the famous Malmsten Lounge at the Åregården Hotel. Åregården Hotel, still alive and lively after being the first on the scene, is located right in town, just across the square from the SkiStar lifts and tram. Its charm is in the historic lobby and the wonderful lounge room furnished with iconic pieces by designer Carl Malmsten and decorated with original 1918 wall paintings. Guest rooms aren’t huge, but appealing with woolen throws, thick walls, and easy access to the town, lake or mountain. (From my pillow I could see skiers working their way down a section of Åre’s ski runs.) Meet up with friends to start or finish your day. This hotel is warm, friendly, comfortable and convenient. The stylish and beautiful Copperhill atrium showcases Scandinavian wood, stone, and copper. Its opposite and equal is the exquisite modern design hotel and resort, Copperhill Mountain Lodge. Architect Peter Bohlin (Apple Stores) somehow combined clean open concepts with warm local wood, rock and copper. On the side of Bjorn Mountain, right at the tree line, it can appear at once spacious and airy and also massive and solid. Our Silver Suite room was one of the nicest hotel rooms I’ve ever stayed in, based on views, living space, bathroom features, and daylight. Can I move in? No matter what the individual room situation, other winning amenities include a spa with multiple pools, saunas and hot tubs (inside and out); an exceptional lobby/lounge that absorbs all sorts of people in various stages of relaxation; a ski rental shop that steps out onto the mountain; and facilities and staff that can handle large meetings, small weddings, multi-generation reunions, and a couple of vagabonds like us. Besides these exclusive properties, Åre offers plenty of lodging options. For the budget conscious, try the Swedish Tourist Association’s property in the center of town. 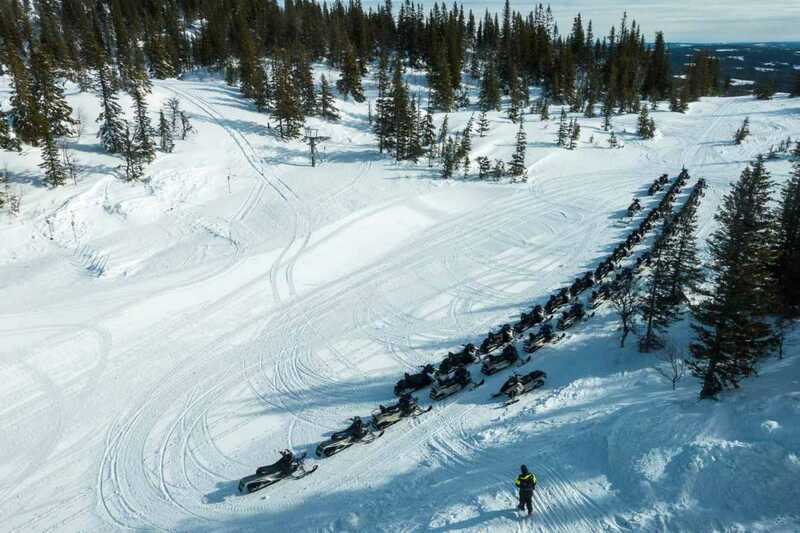 Once you get to Åre, you may be lining up snowmobiles for your group outing. Åre is located between two airports: Östersund, Sweden (OSD), and Trondheim, Norway (TRD). From either airport, train travel to Åre is handy, and bus and rental car options are available, too. The flight from Stockholm to Östersund is under one hour. Ask us. We consider ourselves new ambassadors to Åre and Jämtland. But if you want the the real experts, contact these helpful organizations, and your personal approach to Jämtland will be served to you. Our visit to Åre, Sweden, was hosted by Jämtland Härjedalen Adventure Sweden and by Visit Sweden. This post, however, represents our firsthand experience, our opinions, and our own words and photos, and it has not been reviewed or edited by our hosts. Thanks to all the people who took time to talk to us about their lives and livelihoods in Åre. During this trip, we also visited Stockholm, Karlstad in Värmland and Visby in Gotlund. More Sweden stories coming up. Join us for a tour in Sweden and Norway this August 2019. Check the link for the details. Wow, what an extensive post on a part of the world that I am very unfamiliar with, since I normally focus on tropical travel! I love the Viking history, however, and your photos are superb. Love the reindeer photo with the children. We learned so much about the history since then, too, including the St. Olav pilgrimage and the many shifts of power over the hundreds of years since the Vikings. I’ve never been to Sweden but I enjoyed visiting Are with you. What a beautiful spot. It was interesting reading about Sweden. I’ve never been there, and up until now, had never read anything much about it either. Thx very much for sharing your adventure with us, Kristin. I predict Sweden will jump out over the next year as a top destination. It’s wonderful for active travel, food, culture. We loved our travels there. How wonderful to visit a country where you have genetic routes! Looks like instead of being daunted by the weather, you took advantage of it! Great post! Thanks, Irene. We enjoyed so many aspects of the trip to Sweden, there will be many more posts to follow. I’ve yet to get that far north in Sweden (my family is much farther south) or venture there in the winter! You make it sound wonderful though, so maybe someday. My family–the part I could trace–were from the south, too. (Skåne) But I think I got a much better feel for today’s Sweden by visiting Jämtland, Värmland, and Gotland. Hope you can return some day soon. I’d like to visit Sweden some day. Åre sounds interesting and hospitable. I would particularly enjoy the Jamtli Museum. I appreciate museums that combine natural history with cultural history and I think it is great that children’s exhibits are integrated. Yers, the Jamtli Museum really helped give us context…as did the Värmland Museum down in Karlstad. Thanks for the note. Why in the world haven’t I been to Sweden yet? It’s a shame, especially since I’m Swedish on my mother’s side. And you’ve given so many wonderful reasons to visit Åre when I finally get there. I like the range of attractions and activities to be found there and happy to know that there’s a great gastronomy to enjoy, too. I was afraid it might be all eel, no meat. I loved my visit to northern Sweden a couple of years ago. The two things that struck me most were the wonderful light for photography, and the amazing food (so much skill goes into making great meals with a limited range of ingredients). What a wonderfully surprising destination. I have so many terrific stories about the infamous Faviken from our foodie friends who have eaten there. Looks like there’s a lot more culinary exploration to be had. I’d love the dog sledding and snowshoeing too! The village sounds delightful. Loved the dog sledding part of the post. I enjoyed it in Quebec, so would love to do the same in Sweden. I think more Swedish history needs to be told. It’s fascinating, but undersold. Enjoyed the column!